scrottie is out of town at the moment, which means I have DogTown to myself. Ergo, time to attend to a few cleaning and organizational projects that are difficult to work on with other people around. I sorta-got S a steam cleaner for his birthday - only sorta-got, because what kind of person gives someone a small appliance like that for their birthday?? I mean, I have what I think is a good reason: it's one of the implements that may actually help when S is trying to live in a new space and is experiencing some pesticide exposure side-effects because a lot of pesticides break down when exposed to water. Back in Texas, we rented one, but because of the logistics of this space it would be hard to put a rental to good use. So I looked around a little and found a model that seemed like it would be reasonable. But of course, it's still difficult to steam-clean when there are projects out everywhere, so the steam cleaner had just been sitting and waiting, until today. Which is to say, can you guess the color of the previous occupant's dog? 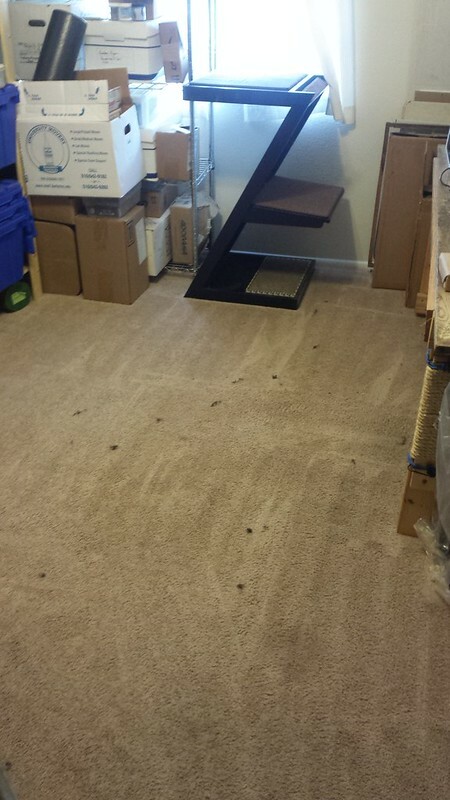 Also, thanks to Arizona's dust, trying to vacuum here is reminding me of what it was like to try and vacuum up all of the diatomaceous earth that got applied to the Villa Maria house's carpet when we were trying to eliminate a flea infestation. The brand-new vacuum filter very quickly stopped looking so brand-new. Carpeting is so stupid in so many different ways. This entry was originally posted at https://rebeccmeister.dreamwidth.org/1223176.html. Please comment there using OpenID. Well done, Helga. Yes, yes, I agree! Carpeting is stupid, impossible to keep clean, allergy inducing, 1950s aspirational nonsense. I lived in so many filthy shared rented places that I grew to hate carpeting. Our current 1930s flat (social housing, permanent tenancy) is entirely without carpets, except for a couple of small rugs, and I'm very happy about it. I tried eating diatomaceous earth. Very strange substance.